CSF, Cerebrospinal fluid is an ultra-filtrate of plasma, produced by the choroid plexus of the lateral ventricle, fourth ventricle and ependymal lining of the ventricles. CSF flows from the lateral ventricle through the foramen of Monro into the third ventricle and then into the fourth ventricle through aqueduct. The CSF exits the ventricular system via the foramina of Luschka (lateral) and Magendie (medial) situated in the fourth ventricle. CSF then ascends into the basal cisterns and around the cerebral convexities where it is reabsorbed by the arachnoid villi which project into the dural venous sinuses. Hydrocephalus is defined as excess of CSF, primarily caused by obstruction to the flow of CSF within the ventricular system. Hydrocephalus is primarily classified into two types: communicating and noncommunicating. Communicating or extraventricular hydrocephalus is caused by extraventricular obstruction at the level of the arachnoid villi and decreased absorption of the CSF mainly caused by prior hemorrhage, meningitis or obstruction of the dural venous sinuses. 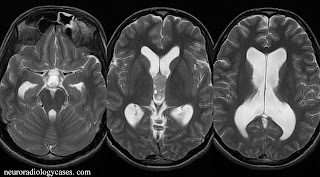 On imaging lateral ventricles, third ventricles as well as fourth ventricle are equally dilated as level of obstruction is after fourth ventricle. Non communicating or intraventricular hydrocephalus is induced by obstructive lesions at various levels within the ventricular system due to various causes such as intra ventricular tumors or aqueductal stenosis. Here dilatation is confined to ventricular system proximal to the level of obstruction. An intra ventricular mass in third ventricle causing non communicating hydrocephalus. Fourth ventricle is not dilated. CSF diversionary procedures like shunt placement are one of the most common pediatric neurosurgical procedures. TheVP shunt is by far the commonest type of shunt used in the pediatric population. The ventriculolumbar shunts are mainly reserved for adults with normal pressure hydrocephalus and patients with small slit ventricles or recurrent VP shunt malfunction. Ventriculoatrial shunts have the distal tip in the right atrium. Complications like sepsis, thromboembolic events, shunt nephritis and pulmonary hypertension have led to the decline of their use except as a last resort. Ventriculopleural shunts are also not favored due to inadvertent life-threatening complications like pneumothorax, pleural effusion and infection. Other proposed shunts have also failed due to various complications and are rarely used in clinical practice. Shunt tube has a proximal intracranial segment inserted through the frontal, parietal or temporal bone, so that the tip and the side holes of the catheter lie within the frontal horn of the lateral ventricle. Care is taken by the neurosurgeons to avoid proximity of the shunt catheter tip to the choroid plexus, to prevent the occlusion of the catheter by the growth of choroid plexus into the tip and side holes of the shunt catheter. The distal tip of the catheter is tunneled through the skin of the neck, thorax and abdomen into the peritoneal cavity for the drainage of CSF. Today neurosurgeons have a wide variety of shunts with programmable valves to choose from for a particular patient. One of the commonly used valves is the Codman Hakim programmable valve which has 18 pressure settings ranging between 30 and 200mmH2O. The neurosurgeon selects one of the settings at the time of shunt placement and is also able to make precise pressure adjustments to help control intracranial pressure and the ventricle size at any time in the future. Diffuse and relatively thin pachymeningeal enhancement along the inner table of the skull and in the dural reflections is a normal finding on post shunt post contrast T1 w MRI images, due to the continued use of the ventricular shunt. 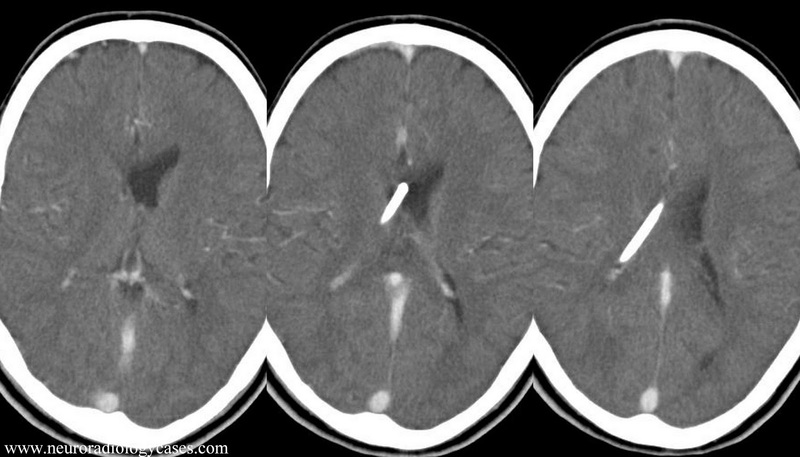 A linear area of Gliosis in right parietal region along the course of shunt tube. If a child with a shunt presents acutely with the classical clinical triad of raised ICP with headaches, vomiting and papilledema is need evaluation of shunt for any malfunction. 1. Shunt infection.The prevalence of shunt infection is reported in 2.6%-38% of cases. Most infections develop within 2 months from the shunt placement. The common microorganisms are Staphylococcus aureus, Staphylococcus epidermidis, or gram-negative enteric infections. 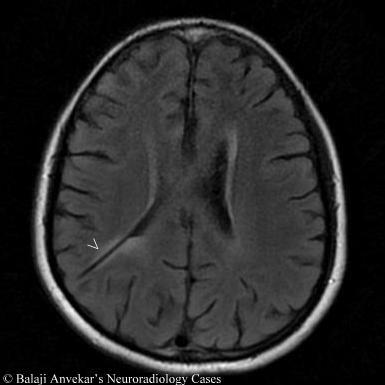 E/o Ventriculitis and meningitis on CT and MR imaging, are ventriculomegaly, an abnormal enhancement along ventricular ependymal lining and or cerebral cortical sulci. Shunt replacement is usually necessary. Repeated infections can lead to cerebral venous sinus thrombosis. 2. Shunt obstruction can occur at any time after insertion, and all points along the shunt course. Presents with clinical evidence of raised intracranial pressure. There two most common locations for obstruction, one is ventricular catheter tip, which can be blocked by ingrowth of choroid plexus, and second is shunt valve, where blood or debris can block the lumen of the valve. If the ventricular catheter is obstructed by ingrowth of choroid plexus into the lumen of the ventricular catheter tip, its removal is complicated by the risk of bleeding caused by avulsion of choroid plexus if the catheter is forcefully removed. 3. Overdrainage refers to when shunt removes more fluid than necessary for that particular patient. Early rapid reduction in ventricular size may result in collapse of the brain and accumulation of extra-axial fluid or results in mid brain compression. * Paradoxical herniation and sunken skin flap, very uncommon complication, seen in patients with a large craniectomy defect who then undergo CSF drainage by either lumbar puncture or ventriculoperitoneal shunt result in marked decrease in Csf pressure, which leads to reduction in intracranial pressure making intra cranial content vulnerable to atmospheric pressure. This pressure imbalance particularly the negative intara cranial pressure deforms brain and mid line. Clinically patient present with depressed level of consciousness, autonomic instability, signs of brainstem release, and focal neurologic deficits. Management: Paradoxical herniation is a neurosurgical emergency and urgent treatment is necessary in order to increase intracranial pressure, to stop any CSF leakage, and restore the continuity of the calvaria. Options include urgent placing the patient in Trendelenburg position and head inclined towards to craniectomy side, clamping ventricular shunts or drains, administering intravenous fluid. Cranioplasty as soon as possible. Paradoxical herniation also has been reported to be effectively and quickly reversed with a lumbar epidural blood patch or clamping ventricular shunt tube. 1. Abdominal pseudocyst, a pseudocyst is a loculated intra-abdominal fluid collection that develops around the peritoneum and is more common than ascites. Indicates the presence of a chronic low-grade infection; however, it is common to find sterile fluid within the pseudocyst cavity when it is aspirated. Symptoms may be consistent with bowel obstruction if the pseudocyst is large. 2. Shunt misplacement can also occur at the distal end of the catheter, including the abdomen, atrium, or pleura. Patients present with abdominal discomfort and eventually may develop headache, nausea, or vomiting. CT scan may discloses, the distal end of the shunt located in the preperitoneal space, resulting in fluid collection under the abdominal incision. 3. Broken shunt. The typical presentation is usually many years after initial insertion and is related to both biomechanical stress as patient's height increases and the inherent degradation of indwelling components because of host reactions. The distal tubing should be free to slide in the subcutaneous tract; however, scar tissue may tether the tubing and produce shear forces that promote fractures as the children grows. 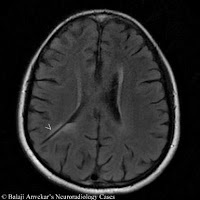 The common presentation is that of mildly elevated raised intracranial pressure. It is also common for patients to present with pain, mild erythema, or swelling over the shunt tract often in a location over the shunt fracture. Shunt series comprising of AP and lateral radiographs of the skull and neck, radiographs of the chest and abdomen are obtained to evaluate for obvious kinks, discontinuity or disconnection. The commonest site of disconnection is between the valve apparatus and the distal shunt tubing. Most shunts have translucent areas that one should be aware of to avoid being mistaken for abnormal disconnection. CT scan of the brain is mainly done to assess the size of the ventricles. 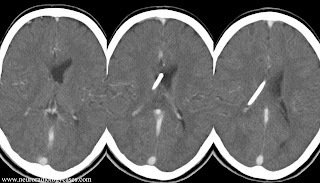 Worsening hydrocephalus and overdrainage with epidural, subdural and intraventricular hematomas and slit ventricles are easily identified on a CT brain study. As mentioned earlier, the programmable valves are susceptible to magnetic disturbances due to their ferromagnetic properties, and hence evaluation of valve pressure is necessary after a diagnostic MRI.